In the summer of 1872, Maria Cheffrey, a Spanish resident of Lytton, British Columbia, arrived in Judge Matthew Baillie Begbie’s courtroom. Cheffrey and her husband had separated six years earlier. After their separation, she worked in Lytton and maintained herself. But that July, he returned. Maria Cheffrey applied to Judge Begbie for a protection order because she feared that her husband might seize her earnings and property. She had good reason to be worried. Until the middle of the 19th century, married men held what amounted to a monopoly over property rights within Canadian families. Under the common law inherited by the English-speaking colonies, a married woman could not enter into contracts, sue, or be sued. Upon marriage, her wages and personal property passed into her husband’s possession. He also gained the right to manage her real estate, and to control any rents or profits it might produce. Minor children likewise lacked the right to contract, sue, or control property. In matters of inheritance, a widow held the right to dower in most colonies, a provision that entitled her to the lifetime use of one-third of her husband’s real estate after his death. A husband could distribute all of his property by will (including his widow’s life estate after her death) as he deemed fit. If he did not write a will, his property ultimately passed to his eldest son. These laws were the cornerstones of a patriarchal social order, facilitating male headship of households and the concentration of property among a small number of men. The law was structured so that married women and minor children would be financially dependent. There were very few exceptions and those could be found in the Court of Chancery, where married women with wealthy families or benevolent husbands could have property set aside for their independent use through special settlements. The Court of Chancery was also charged with protecting minors from irresponsible parents. Yet for various reasons, including the high costs involved, very few individuals were able to avail themselves of the protections offered by this court. Figure 7.3 A widow (like this one in Ethelbert, MB, ca. 1924) would have control over the estate of her deceased husband only until the eldest son reached adulthood. This situation changed slowly in the late 19th and early 20th centuries as colonial, and then provincial, legislatures passed statutes changing the laws respecting family property in English Canada. The changes varied by province, but the general trend over time was toward granting married women and children greater legal rights. The first wave of legislation, passed during the 1850s and 1860s, granted limited property rights to wives in emergency situations, at the discretion of the courts. Maria Cheffrey was fortunate enough to be the beneficiary of one of these new laws, and Judge Begbie granted her a court order to protect her property from her husband. Over the latter part of the 19th century, politicians in the English-speaking provinces granted married women substantial new rights over earnings and property, as well as the capacity to contract, sue, and be sued — all without the need for a protection order. Then, in the early 20th century, some provinces imposed new obligations upon married men. These new maintenance laws required men to support their legal families and children born out of wedlock. In matters of inheritance, provincial legislators wrote new laws in the 19th century providing for a more equitable distribution of property among spouses and children, in cases where husbands and wives failed to write wills. In the early 20th century, legislators in every province took an even more activist approach to inheritance law reform, adopting dependants’ relief statutes, which permitted family members to apply for a larger share of an estate under certain circumstances. Why were the laws changed? Lawmakers’ motives varied from province to province and from one decade to the next. Frequently they were responding to the urging of feminist activists and legislators, but this was not always the case. In passing the various laws, some proponents and legislators hoped to protect wives and children from financial hardship and foster gender equality. Others intended to stimulate commercial activity and limit government expenditures on emerging social welfare programs by holding family members legally responsible for maintenance. The results of the laws were not easy to predict. For example, in several provinces, conservative judges attempted to limit the impact of married women’s new property rights. Even so, historian Peter Baskerville’s research on British Columbia and Ontario shows increased property ownership, borrowing activity, and entrepreneurship among married women. Other evidence indicates that new rights produced new expectations among women, in both their personal and political lives. The rights of family members under Quebec’s civil law were different. As Bettina Bradbury et al., have written, “Marriage automatically created a community of property, legally shared equally by both spouses, but administered by the husband.” Those final words are important. While the phrase “community property” sounds egalitarian, the husband’s administrative rights meant that, in practice, he could generally dispose of the couple’s property as he wished. Property inherited by either spouse was an exception to this arrangement: each retained separate ownership of inherited property, yet neither had the right to dispose of that inherited property without their spouse’s consent. In addition, a small number of wealthy couples signed marriage contracts specifying a “separation of goods,” which permitted each spouse to maintain separate property. Even in these cases, however, the law stated that wives needed their husbands’ authorization to manage their separate property, and the courts interpreted this requirement quite strictly. With respect to inheritance, Quebec, unlike English Canada, operated according to a system of a partible inheritance, in which the deceased’s property was divided amongst his or her heirs. A widow or widower was entitled to a half-share of any community property. If the deceased left no will, the remainder would be divided equally among descendants, or according to more complicated formulae among other heirs. The situation with respect to spouses’ separate property was less favourable. Legislation passed over the second half of the 19th century that gradually eliminated the widow’s customary right to dower in her husband’s separate lands, since traditional dower rights were a hindrance to land transfers. Children’s right to a fixed share of their parents’ separate estates was likewise abolished. After these changes, separate property could be distributed freely according to the terms of a will; in the absence of a will, it would be distributed to the children or other heirs, with the spouse ranking 13th in the hierarchy of potential claimants. The liberalization of family property rights came more slowly in Quebec than in the other provinces. This was not due to the absence of feminist agitation. Feminists in Quebec campaigned for a better claim to family property and greater legal independence throughout the early 20th century. While they gained improved inheritance rights respecting the spouse’s separate property in 1915, other markers of improved status under the law were slow to come. Women in Quebec gained the vote last, in 1940. Political and clerical opposition hindered their efforts to achieve the franchise and to more radical changes to married women’s property rights, and to gain them the legal capacity to act for and represent themselves. Such change would have to wait for a resurgence of feminist activity in the 1960s, accompanied by the social, religious, and governmental shifts engendered by the Quiet Revolution (see Section 9.9). Property rights historically favoured males over females, including sons over wives. Women’s rights regarding marital property increased slowly and unevenly in the post-Confederation era. Inheritance laws in Quebec were distinct from those in the rest of Canada and were the focus of feminist reform efforts in the early 20th century. 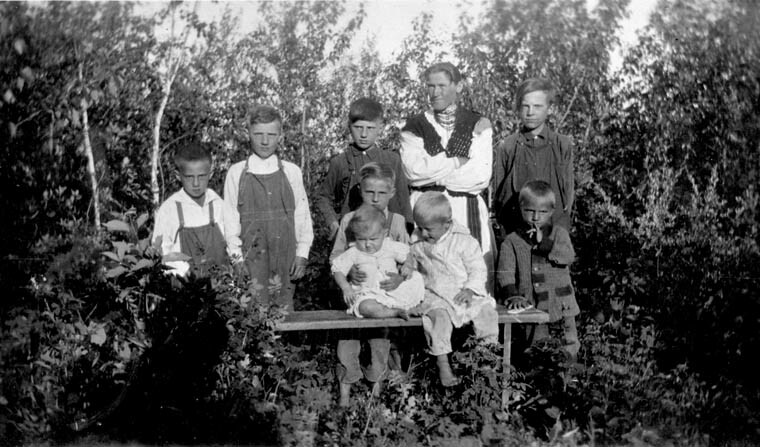 Widow & children on farm in Ethelbert, Manitoba by George E. Dragan / Library and Archives Canada is in the public domain. 7.4 Families and Property Rights in Canada by Chris Clarkson, Department of History, Okanagan College is licensed under a Creative Commons Attribution 4.0 International License, except where otherwise noted.